Home » News & Events » Government Doubles Official Estimate: There Are 35,000 Active Museums in the U.S.
Government Doubles Official Estimate: There Are 35,000 Active Museums in the U.S. 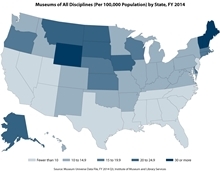 Museums of All Disciplines (Per 100,000 Population) by State, FY 2014. Click image for a larger view. Seattle, Washington—The U.S. agency that is the primary source of federal funding for the nation’s museums and libraries today released a new estimate of the number of active museums in the United States. The Institute of Museum and Library Services (IMLS) announced that there are 35,144 museums in the U.S., more than double the agency’s working estimate of 17,500 from the 1990s. IMLS Director Susan H. Hildreth announced the estimate and the availability of an online data file in Seattle, Washington, at the annual conference of the American Alliance of Museums, the nation’s largest annual gathering of museum professionals. The data file may be accessed at: www.imls.gov/museum_universe. She said, “Americans love their museums. Museums of all types—35,000 strong— are a vital part of the American cultural and educational landscape. They are places where Americans go to pursue the discovery of art, history, science, technology, and the natural world. With 16,880 historical societies and historic preservation organizations alone, we can see that the preservation of history and culture is a passion that starts at the grassroots level. At IMLS we are proud to trumpet the impact of America’s museums at the federal level. “Museums in America are powerful drivers of educational, economic, and social change and growth in their communities. As stewards of our collective cultural heritage, they provide the rich, authentic content for a nation of learners. Museums respond to the needs of their communities and are recognized as anchor institutions. They are valued not only for their collections and programs but as safe, trusted places that support the ideals of our democratic society. The total includes museums of all disciplines: arboretums, botanical gardens, nature centers; historical societies, historic preservation organizations, and history museums; science and technology centers; planetariums; children’s museums; art museums; general museums; natural history and natural science museums; and zoos, aquariums, and wildlife conservation centers. The largest categories are historical societies and unclassified and general museums with 48 percent and 33 percent respectively. View graph of museums by discipline (PDF). The newly released Museum Universe Data File is available on the IMLS website at www.imls.gov/museum_universe. It includes organization name, address, city, state, museum type, revenue, phone, and website, although not all of the museums have complete information for every field. It also includes a variety of geographic markers that can be used to incorporate the data into a wider variety of applications and to visualize it in map form. The data file is available for both commercial and non-commercial use, and museum practitioners and researchers are encouraged to use it as a reference file for analysis of the museum sector. A core source of data for the Museum Universe Data File comes from the Department of Treasury, which collects financial information for all active nonprofit organizations on an annual basis. IMLS used two different types of records (IRS Form 990 and IRS Form 990-N) to identify nonprofit museums that filed from 2009 through 2013. This one source provided 77 percent of the museums in the file. In addition to organizations that filed IRS forms, data was also drawn from IMLS’s own administrative records (2009-present) and from third party commercial vendors. The earlier estimate used a very different methodology, one that was based primarily on information IMLS obtained from state museum associations and their membership records. By using administrative data for the new estimate, IMLS obtained more complete information than it could from a survey of the field, and with less expense. This new data file is a public resource that is maintained by the IMLS Office of Planning, Research and Evaluation. The file will undergo continual review and will be updated and enhanced with new data elements over time. IMLS encourages the museum community to access the data and to contact the IMLS research staff if there are institutions known to be operating in the U.S. that do not appear in the current data file, or in the event that museums in the file are no longer active. We are happy to accept comments and suggestions for improving the file at research@imls.gov.